Palermo was founded in the 8th century BC by Phoenician tradesmen around a natural harbour on the north-western coast of Sicily. The Phoenician name for the city may have been Zîz, but Greeks called it Panormus (see also List of traditional Greek place names), meaning all-port, because of its fine natural harbour. It should be noted however that the city was never Greek. Palermo is widely considered to be the most conquered city in the world, as showed in the following article. Palermo remained a Phoenician city until the First Punic War (264-241 BC), when Sicily fell under Roman rule. The Roman period was one of comparative calm, Palermo coming under the provincial administration in Syracuse. When the Roman Empire was split, Sicily and Palermo came under the rule of the Eastern Byzantine Empire. In the 9th century, Sicily was divided into two prefectures by the Byzantines. The two prefects went to war with each other, and Euphimius, the winner, dreamt of reuniting the Roman empire. However, he lacked an army, so he asked the Saracens (Muslim Arabs), at the time the up-and-coming power in the Mediterranean, to lend him theirs. Within a week of the Saracens' arrival in Palermo in 827, Euphimius died mysteriously, and they decline to leave. By 878 all of Sicily, except for a few Byzantine enclaves near Taormina, was controlled by the Saracens. In 905 they captured those too. 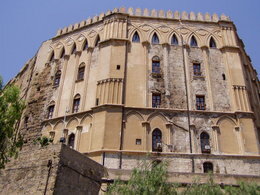 The Arab rulers moved Sicily's capital to Palermo where it has been ever since. In 1060 the Normans launched a crusade against the Muslim emirate of Sicily, taking Palermo on January 10 1072 and the whole island by 1091. The resulting blend of Norman and Arab culture fostered a unique hybrid style of architecture as can be seen in the Palatine Chapel, the church San Giovanni degli Eremiti and the Zisa. Sicily in 1194 fell under the control of the Holy Roman Empire. Palermo was the preferred city of the Emperor Frederick II. After an interval of Angevin rule (1266-1282), Sicily came under the house of Aragon and later, in (1479), the kingdom of Spain. Sicily's unification (1734) with the Bourbon-ruled kingdom of Naples as the kingdom of the Two Sicilies inflicted a devastating blow on the elite of Palermo, as the city was reduced to just another provincial city, the royal court residing in Naples. Palermo rebelled in 1848 and held out against the Neapolitan crown until May 1849. Palermo survived almost the entire fascist period unscathed, but during the Allied invasion of Sicily in July 1943 suffed heavy damage. The importance of Palermo got another boost when Sicily became (1947) an autonomous region with extended self-rule. But any improvement was thwarted by the rising power of the Mafia, which still today is a dramatic feature of the city, as well as the whole Southern Italy. Because Sicily is not as prosperous as the mainland Italian regions, immigrants or guestworkers rarely make headway into Palermo, except for illegal immigrants. Despite the immigrant population, the city is one of the fastest growing in Italy considering that the population under 14 still outnumbers those over 65. The Porta Nuova ("New Gate") is the monumental access to the centre of the city. 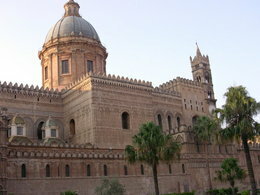 Palermo is among the richest cities of monuments in Italy, and perhaps in the world. It is also the main centre of Norman architecture in Europe. Santa Teresa alla Kalsa derives its name from an Arab term meaning elected. The church, constructed in 1686-1706 over the former emir's residence, is one of the most outstanding examples of Sicilian Baroque. It has a single, airy nave, with stucco decorations from the early 18th century. Santa Maria dello Spasimo was built in 1506 and later turned into a hospital. For this temple Raphael painted his famous Sicilia's Spasimo, now in the Museo del Prado of Madrid. The church is today a fascinating, air-open ruin, which occasionally houses exhibitions and musical shows. Palazzo dei Normanni, one of the most beautiful Italian palaces and a notable example of Norman architecture, probably built over an Arab fortress. It house the famous Palatine Chapel. Palazzo Abatellis, with the Regional Gallery. It was built at the end of the 15th century for the prefect of the city, Francesco Abatellis. It is a lassive though elegant construction, in typical Catalan Gothic style, with Renaissance influences. The Gallery houses an Elenora of Aragon bust by Francesco Laurana (1471) and the Malvagna Tryptich (c. 1510), by Jan Gossaert and the famous Annunziata by Antonello da Messina. The Museo Archeologico Regionale is one the main museums of Italy: it includes numerous remains from Etruscan, Carthaginian, Roman and Hellenistic civilizations. The Cathedral has a heliometer (solar "observatory") of 1690, one of a numberTemplate:Fn built in Italy in the 17th and 18th centuries. The device itself is quite simple: a tiny hole in one of the minor domes acts as Pinhole camera, projecting an image of the sun onto the floor at solar noon (12:00 in winter, 13:00 in summer). There is a bronze line, la Meridiana on the floor, running precisely N/S. The ends of the line mark the positions as at the summer and winter solstices; signs of the zodiac show the various other dates throughout the year. The "solar clock" can be up to 16 minutes fast or slow. The reason for this is explained fully in Main Articles Analemma and Equation of time, but can be summarised thus: the earth rotates on its axis every 24 hours but it also orbits the sun. Thus the sun will appear directly over the same spot increasingly early (or late) each day. The correct track to draw on the ground is a figure 8 rather than a line. The Orto Botanico of Palermo, founded in 1785, is the largest in Italy with a surface of 10 ha. Close to the city is 600 meter high Monte Pellegrino, with spectacular views of the city, its surrounding mountains and the ocean. In his book, "Travels in Italy", Goethe described Monte Pellegrino as the most beuatiful promontory in the world. The patron saint of Palermo is Santa Rosalia, who is still widely venerated. On the 14th of July, people in Palermo celebrate the "Festino", which is the most important religious event of the year. The Festino is a procession in the main street of Palermo to remember the miracle attributed to Santa Rosalia who, it is believed, freed the city from the Black Death in 1624. The cave where the bones of Santa Rosalia were discovered, is on Monte Pellegrino (see above): when her relics were carried around the city three times, the plague was lifted. There is a Santuario marking the spot and can be reached via a scenic bus ride from the city below. Before 1624 Palermo had four patron saints, one for each of the four major parts of the city. They were Saint Agatha, Saint Christina, Saint Ninfa and Saint Oliva. Palermo International Airport is located 32 km (19 miles) west of Palermo. Buses depart roughly every 30 minutes from the central railway station (via Piazza Ruggero Settimo) to the airport, and can sometimes during rush hour take more than an hour. A paper from University of Bologna describing Heliometers in Italian Cathedrals. 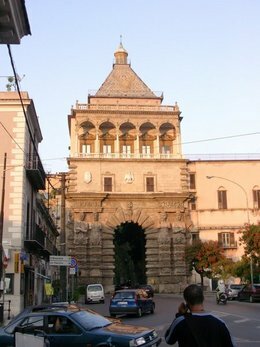 Other towns in the province: Termini Imerese, Monreale, Bagheria, Cefalù.